ATI has a well-earned reputation for providing outstanding T5 fixtures. The ATI SunPower T5 High-Output fixture is a popular choice amongst hobbyists who want high-end performance, but find the ATI PowerModule a bit out of reach. With individual parabolic reflectors made from silver-coated 98% reflective aluminum, active cooling system, electronic ballasts, acrylic shield and hanging kit, the ATI SunPower offers exceptional performance and a sleek look. The ATI SunPower High-Output fixture, sports superior design and high-end components which produce 50% more light than most other equally sized T5 fixtures without using more energy. Each unit is optimized with an active cooling system for it’s electronic ballasts and T5 bulbs. Asides from performace, the ATI SunPower just looks great! We’d be proud to have this ATI T5 fixture hanging over any of our tanks, and we are confident you will be too. The ATI SunPower and PowerModule fixtures are available at reefgeek. 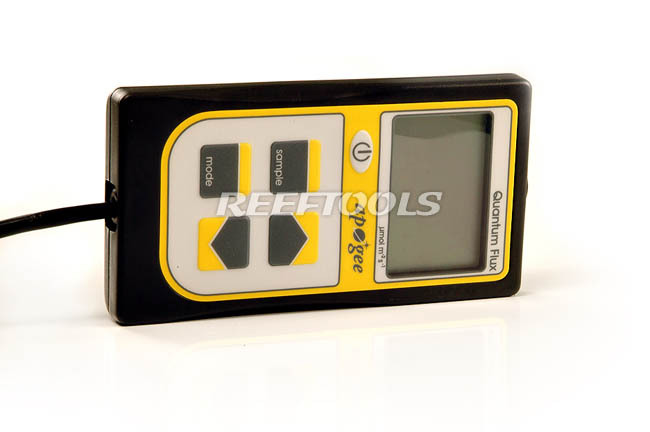 The Apogee Instruments Quantum Meter is an excellent reef tool. With so much of the focus in reefkeeping placed on lighting, one must wonder, how do I make sense of it all. A quantum meter is wonderfully helpful in measuring light intensity (specifically relevant to photosynthesis; we’ll get back to this), comparing bulbs and lighting options, making decisions about coral placement, and much more. A quantum is simply the reference to the amount of energy carried by a photon. 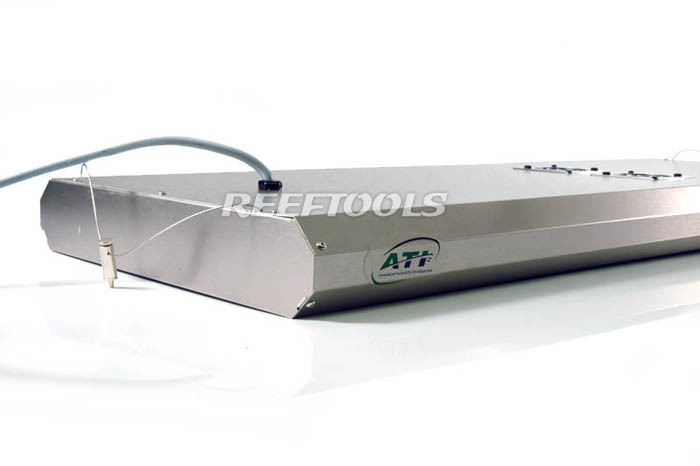 The Apogee Instrument Quantum meters approximate Photosynthetic Photon Flux (PPF) for Photo synthetically Active Radiation (PAR) between 400 and 700 nanometers. This is of value since photosynthetic organisms primarily utilize the number of photos between these wavelengths. PPF is measures as µmol m-2 s-1 (micromols of photos per meters squared per second). In order to use this meter in the aquarium, we mounted the sensor on a simple “holder” made of 3/4″ pvc ( a long piece, then an elbow, short connector piece, and another elbow). This allowed us to move the sensor around while always having it pointed at the light source. Once the sensor is mounted, we took several measurements above the waterline, then right below, and pretty much all over the tank. Many hobbyists turn their powerheads/pumps off so that the water surface is not disturbed during the reading. We intentionally keep ours on, since that best replicates the conditions the corals are under. It was amazing to see how much variation there is within a pretty small area. We were able to compare metal halide reflectors, ballasts and bulbs, T5 reflectors, ballasts and bulbs (as well as the results of overdriving T5 bulbs). We will report specific results in follow-up articles. Having used the quantum meter over a large number of display and frag tanks, and were extremely impressed with the information it provided. Apogee Instruments, developers of high-quality instrumentation to monitor the environment, is pleased to announce that our quantum meters now include both data recording capability and sun and electric calibration with each meter. Each meter can store up to 99 manually recorded measurements. In automatic mode, measurements are made every 30 seconds and averages are stored every 30 minutes. Daily totals are also calculated and the past 99 days are recorded. These meters still feature our innovative blue lens for improved spectral response along with our cosine-corrected head, self-cleaning characteristics, and long-term stability. 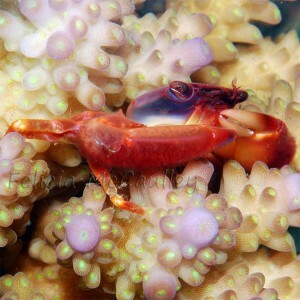 There are two genera of Guard Crabs commonly found in the aquarium trade – Trapezia and Tetralia – that are symbiotic on small polyp stony corals such as Acropora, Pocillopora, Stylophora, and Seriatopora corals. 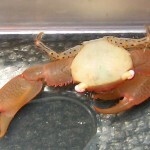 Trapezia crabs can measure up to 1-3/4″ from elbow to elbow. They are also “equal handed,” having same-sized chelipeds (claws). 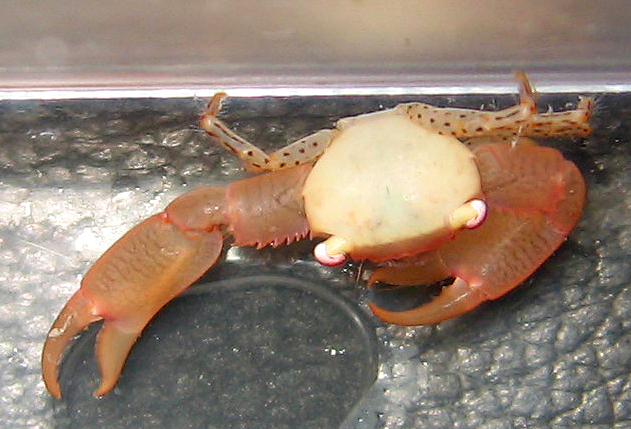 Trapezia crabs are symbionts on Pocilloporid corals. Trapezia cymodoce, Trapezia septata, and the beautiful, red-spotted Trapezia rufopunctata host on Pocillopora corals, while the brown-clawed white Trapezia guttatus hosts on Seriatopora Birdsnest corals. These crabs are perfectly camouflaged to their host coral. The legs of T. guttatus are almost identical to the branches of a Birdsnest coral, and the spots of the T. rufopunctata mimic the host coral’s polyps and color. In captivity if a Pocilloporid coral is not available, a Trapezia crab may host on an Acropora coral. 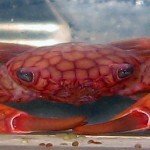 In captivity it’s best to keep large Trapezia crabs on larger SPS colonies. Their activities have (uncommonly) been reported to cause damage to smaller colonies or frags. Guard Crabs are beneficial to their host corals, as they protect the coral from some pests, predators, and settling sediment. In the wild scuba divers see them pinching the underside of the crown of thorns star – a large predatory sea star that consumes coral – until it moves on to an unprotected coral. I’ve personally witnessed an Acropora crab evict a smaller pest blue eyed crab from its host coral. Blue eyed crabs can cause serious damage to the coral colonies they inhabit. 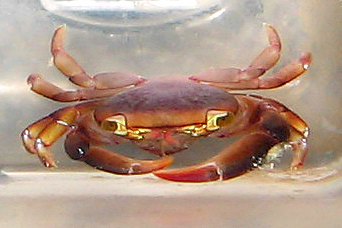 Guard Crabs also remove debris that settles on the host coral, preventing tissue necrosis. 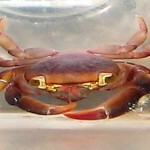 In turn the crab gets a home and a free meal. In the aquarium Pocillopora and Acropora Guard Crabs appreciate the occasional target feeding of small mysis, but most of their food is provided by their host coral. They are easy to keep in captivity, but must be given an SPS coral to host on. Recommended for tanks up to 25gallons. Includes pump. Skimmer goes inside tank. Sunlight Tek-Light ELITE T5 Fixture – has built in cooling system. Link Up to Three Fixtures Together to Form a 4-Lamp or 6-Lamp Fixture! The AquaticLife 10,000K Swing Arm Aquarium Light combines function and great looks! Custom fit almost any tank.